In todays tough business world office staff are finding themselves under much greater pressure to perform and deliver highly effective results. It is with this in mind that CBH Training has an array of office skills courses to assist clerical and sales staff to perform better and deliver results to suit the business needs. Do you struggle to know what to write when you need to take Minutes? Do you miss some of the key discussion points? Do you take lots of notes that you then find difficult to write back into Minutes? Have you ever had any training on how to take Minutes? Would you like to know how to take Minutes effectively? Click on the heading above. would you like to double your handwriting speed? 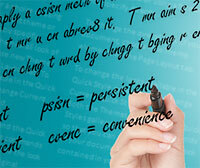 Did you know that the average handwriting speed for an adult is around 20 words per minute (wpm)? Speaking rates can vary from 100-400 wpm. For example, conversational speech falls between 120-200 wpm; audio books are between 150-160 wpm and commentators are within the 250-400 wpm range. As you can see there is a big gap between the written and spoken word! If you need to take notes quickly and accurately and would like to increase your handwriting speed, click on the heading above to find out more. Places are strictly limited to ensure value added to all participants – so enquire early!